A posed image of two young school girls dressed in their finery; one holds a woven school bag, the other a jump rope.. A 14 3/4" x 10 1/2" children's page from People's Popular Magazine. It is the Junior Joys for Girls and Boys. This is the Girl's page. It features the story of The Sad Bird-House and a 5 1/2" x 2 3/4" "jolly calendar" for little girls to trace or draw outlining women's work by day of the week i.e. Monday is wash day, Tuesday is ironing day. At the base of the page is Polly Flinders, a 1 3/4" paper doll with 3 outfits and a doll plus a she also has an anthropomorphic or dressed bird with a sinlge outfit. Edge wear and toning. 14 pp wrappers. Stories and activities involving girls as they should be and behave. Content includs Nancy the little Nurse, a free 'Twinkle' engagement ring premium, Betty Bright-the proper little girl who does everything well, puzzles for the little nurse, Dainty dollies, Sue of the Children's Zoo, Sally Sweet on Sunshine Street, Wendy at Willowtree Farm, Patsy the Panda, The friendly frog, playtime with girls playing jump rope and a Twinkle paper doll anda concluding story titled 'When I Grow Up'. Measures11" x 8 1/2". Some wear. . An unused large format book titled Be a Li'l Miss Designer - With this revolutionary new Colorful Self-Sticking Plastic Dressmaking Kit - No Glue No Sewing No Mess! Manufactured by Neptune Plastics, Inc. Brooklyn 16, NY.No. 898. Includes 4 different colors, 6 different styles (patterns), one 13" Model Doll that stands by itself, 4 storage bags for parts and many additional suggestions. "Unlimited Hours of Fun for Girls of Every Age" When opened the inside cover depict images of the various models and instructions. Affixed with plastic spirals at center is a plastic wrapped card that includes the doll, the patterns and the material including ruffled trim pieces. The back cover further promotes the product Instructions on reverse read "Choose your outfit -- cut out paper pattern - cut plastic to shape of pattern -- cut ruffles to size. Dress model with self-sticking clothes and ruffles. Dolls include Miss Holland, Miss Hawaii, Miss Western and Miss America. Measures 13 1/4" x 10 1/2". A 12 1/2" x 8 1/4" printed cardboard form to be used to improve the appearance of a dress on a hanger. No. 100 Model M. It is an Ajustrite Dress form "The weight is on the tape. String tie at top that attaches to a hanger allows for proper placement of the form. The belt from the dress is used to create a streamline waist. Illustration and narrative instructions at base. Reverse is blank.. The front cover depicts a little girl playing on a porch in front of a door with a die-cut window, exposing her mother on the next page. The last two pages have an additional mother and daughter--could be two sets of twins. There names are Dawn, Celia, Amy and Bonnie. Punch-out dolls and costumes to cut. Measures 12 1/2" x 8 1/2". 6 Costume pages..
Skating Stars in three different poses. All of their costumes are designed for the ice, including a hula skirts, a sailor suit, princess, rag-a-muffin and much more. Measures 12" xc 10". 6 Costume pages.. 26pp. Grey paper wrapper with a decorative border surrounding the title on the front cover. A small box of text in the center describes the play as "full of ghostly excitement and spooky frolic", then gives the run time and actors required for the production. 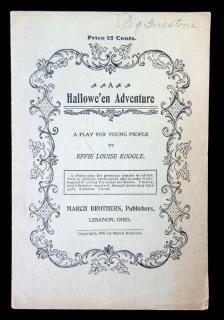 The inside cover lists other holiday-specific plays published by the March Brothers related to Hallowe'en, Armistice Day, and Thanksgiving, as well as two "Americanization Plays" that focus on citizenship and assimilation. And on the back cover, there is an ad for "Fancy Dress Costumes for Masquerade Parties and Entertainments" that lists options for children, women, as well as specific options such as Uncle Sam costumes, colonial costumes, and Santa Claus costumes. Play tells the story of a young girl named Nell Norton and her friends at an all-girls school hatching a scheme to sneak out on Halloween and visit Sleepy Hollow to see some ghosts. Boys from a nearby all-boys school, not allowed to go to the festivities due to a prank the earlier year, learn about the girl's plan and decide to try and scare them by dressing up like ghosts, pretending to capture them, then appearing as famous figures like Rip Van Winkle, Napoleon, and Ichabod Crane. However, Nell and her friend Gloria, while frightened by the fake kidnapping, have fun meeting these ghosts and are disappointed when they must leave. The play ends with the boys taking off their costumes and admitting that Nell and Gloria may have fallen for their trick, but it wouldn't be long before the girls found them out - as one admits, "our humiliation will equal their fright". With obvious admiration for Nell and the girls, they agree that it was all worth it to "clash wits with girls of their caliber". 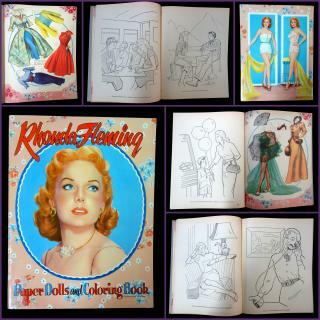 Measures 7 1/4" x 5"..
Paper doll book with an illustration of Rhonda Fleming in portrait view, surrounded by brightly colored decorative elements. Two dolls printed on back cover as punch outs, 11" tall. 4 pages of costumes, all uncut, with a decorative border mimicking the pattern on the cover. 48 coloring pages, unused, with captions on the bottom of each coloring page to create a narrative of Rhonda Fleming's life: describing a normal day for a famous actress, presenting her as an ideal for women and young girls to strive for. 14" x 10 3/4".. A uncut 7 1/2" x 6 5/8" paper doll sheet promoting Brook's Glace Spool Cotton. It includes a 5 1/2" young adolescent male paper doll with a note in his hand "with Brook's Compliments" and spool thread at his feet. It also includes four (4) miliatry costumes from different branches of the service. The reverse of has advertising to correspond with the reverse of the dolls and the costumes. Instructions for cutting and use also found on reverse..
An 11" x 11" book with four (4) "perfectly shaped" statuesque young women paper dolls on the covers adorned in undergarments. The four (4) costume pages contain nip waist dresses and outfits. Most include a matching hat. Also includes a wedding gown. There is one somewhat uncharacteristic outfit with loose fitting pants and sweater with a letter sweater. The border decorations are 1940s feminine niceties such as cosmetics, jewels, gloves, handkerchiefs and handbags-- each with a ribbon background. . 15 5/8" x 10 3/4" uncut paper doll book with four (4) 12" adolescent girls - Judy, Betty, Molly and Patsy. Six (6) pages of costumes including play clothes, prom wear, school outfits, shoes with anklets, school books with a book strap and of course hats to match each of the outfits -- everything a Junior Miss would wish for. .
A 13 3/4" x 10 5/8" book with six (6) punch out paper dolls on the covers including an Air Hostess. Six (6) costume pages. Note that the costumes are formal, as one would have worn on an airplane in the 1940s. Additionally the costumes are for an affluent family vacationing. Notably there is only one additional costume for the Air Hostess, which is an additional uniform (all work and no play). Airplane motif background decoration. . Two letters from Mary in Holliston, MA to her friend, Lovina Emerson, in Southboro [sic], MA. The letters detail the life of Mary and her close relationship with Lovina. The letters are almost two years apart and show the changing lifestyles between the two. Mary is teaching while Lovina is starting a family. They have mutual friends that are discussed along with the happenings in their hometown. Feb. 29, 1848; Holliston; addressed Southboro, Mass - A letter, from Mary, to update her friend. Mary has not written and cannot believe how much time has gone by since she came from Southboro. She asks about Lovina’s mother’s health and the school that Mr. Alden is teaching in. She discusses her students and how some are almost twenty years old and some not quite four years old. The total number of students is 62, twenty-five of them under the age of eight. Mary mentions the dramatic change in Holliston and how it is not easy to recognize, “the Railroad, the Depots & several new buildings nearby, make the place look quite differently from what it used to.” She wishes the “people were only growing better” and explains “the evil one” is hard at work and has succeeded in setting up a “dancing school.” Mary comments that her cousin Charles envies Mr. Emerson’s “happiness in getting such a wife.” She talks of Miss Lydia Walker and how her gentleman “did not wait upon her home once” and questions if she will avail of the 1848 Leap Year (presumably referring to the folk lore that women can propose to men on leap day). Their friend Almira passed away and Mary is concerned that so many of their friends have passed, their turn will come soon. She asks to be remembered to Lovina’s mother, husband, and daughter. A short note on back mentions running into mutual friends and another begs her to please destroy this letter and the next one. 7 + pp paper doll book - 1 and a 1/4 card stock pages and the back cover are the punch out dolls. The remaining 2 pages are a page of cut-out costumes for each doll. The paper dolls are created after six (6) real models from the John Robert Powers Modeling agency with illustration of Powers looking up at the model lineup on front cover. Images from photographs of Doris Meyer, Angela Green,Lillian O'Donnell, Frances Donelon, Helen Dillard and Eileen Nolans. Each page has a theme including models for the Movies, the Newspaper, as a Dancer, the Radio Star Model, a career girl Model and a Stewardess Model. Each with appropriate background illustrations. Measures 14 3/4" x 9 3/4". . A diary/common place book from New York in the 1840s. It belonged to a young woman named India Allen. Not much biographical information is known about India, beyond the fact that she lived at 6 Washington Square, New City. Based on her writing it is clear that she and her family comes from some means, and moved within some very high social circles. The first half of this journal is mostly quotes from a variety of well-known authors, such as Longfellow, De Ponte, Wilde and Pitt Palmer. The majority of these quote entries are dated between 1841 -1846. At the start of the New Year in 1846, India begins to record almost daily entries until June of the same year. These short entries detail her daily life, what she did each day (read, sew, who she called on) and the events or dinners she went to. While they are short, they are sometimes quite humorous. On January 3, she writes, “Went to a party, enjoyed myself tolerably.” In 1848 India goes into great detail about a wedding she attended in May of 1848, listing other guests and gifts that were received. Additionally around this time are some of India’s most emotional entries as she describes the death of her very close friend, Fidelia Marshall (1826-1848). In two entries, which she titled “A Brief Sketch on the Last Hours of my Departed Friend”, and “Obituary Written upon the Death of My Friend.” These two entries in particular showcase India’s intelligent and reflective disposition. The rest of the journal is again filled with quotes from literature, as well as a few recipes, such as Cayenne Pepper Tea (meant for sore throats). Measures 7 3/4" x 6 1/2".